Tara Expeditions organizes research missions on board the legendary schooner Tara to study and understand the impact of climate change and the ecological crisis on our oceans. These scientific expeditions are carried out in collaboration with prestigious scientific institutions and laboratories. For more than ten years now, Tara Expéditions has been taking tangible action to increase environmental awareness among the general public and young people. For the Tara Oceans Polar Circle expedition (May/Dec. 2013), Tara spent seven months traveling around the Arctic Ocean via the Northeast and Northwest passages. Most of the scientists and institutes involved in the Tara Oceans expedition (2009/2012) accompanied the project to study the polar marine ecosystem and complete their research on plankton, ongoing since 2009. New research programs geared to this region were also included, with the aim of exploring the concentration of plastic particles and assessing levels of pollutants. Tara then set off on the Tara Méditerranée expedition (May/Nov. 2014). The twofold objective of this expedition was to promote awareness of the various environmental challenges in the Mediterranean region and accomplish a scientific study on micro-plastic pollution. Panasonic has been supplying the Tara crew and scientists with IT equipment since 2008. The devices are used to extract biological and environmental data in situ from samples of plankton in particular. The equipment is designed to withstand the conditions inherent in any ocean expedition, such as high humidity, risk of splashing, corrosive environment, bumps and vibrations typical of any sea voyage, and huge fluctuations in heat. Temperatures can vary from -40°C in the Arctic to +35°C in the Mediterranean. Here more than ever, Panasonic's rugged products and expertise in "all-terrain" mobile solutions were put to the test. As supplier of IT equipment on board the Tara, Panasonic provided various laptops and touchscreen tablets, forming a diverse base of hardware: in the Toughbook range of laptops, a CF-53 (non-touchscreen model), CF-C2, CF-AX3 and CF-19, and in the Toughpad range of fully rugged tablets, FZ-G1 (10") and FZ-M1 (7"). Boasting different features, sizes and levels of ruggedness, the devices were used in a hazardous climatic setting, where the weather forecast was difficult to predict and icy conditions prevailed. each and every day in extreme conditions..
"The Toughpad and Toughbook devices are used extensively on board Tara. Thanks to their reliability, durability and battery life - whatever the weather and despite the humid, cold and permanently iodized atmosphere - we can really rely on them for our daily work. They're the perfect travel companions," says Romain Troublé, Secretary General of Tara Expéditions. Throughout the Tara Oceans Polar Circle expedition in 2013, the Toughpad FZ-G1 was used non-stop, both on deck and in the Tara laboratory. It continuously took readings relating to the analyses carried out on board and was used for collecting data. The Toughpad FZ-G1 is a fully rugged 10.1" tablet running under Windows 8.1 Pro. It complies with MIL-STD-810G for a drop rating of 120 cm, and is also water- and dust-resistant to IP65. The Toughbook CF-53 laptops were used in Tara's wheelhouse for navigation and cartography purposes, operating in redundant mode to support video feed by satellite. "We used two laptops on board Tara exclusively for navigation. They're absolutely essential tools for guiding any expedition around the North Pole. I was really impressed by the ruggedness and performance of these Panasonic products," adds Captain Loïc Vallette. "Their high level of reliability and stability in terms of power is also a critical factor, as the on-board power supply is not always stable - power cuts are a regular occurrence," explains Romain Troublé. The CF-AX3 was mainly used for communication and presentation purposes. It is handy to use thanks to its practical size and ability to convert into tablet mode, while still offering the necessary durability. 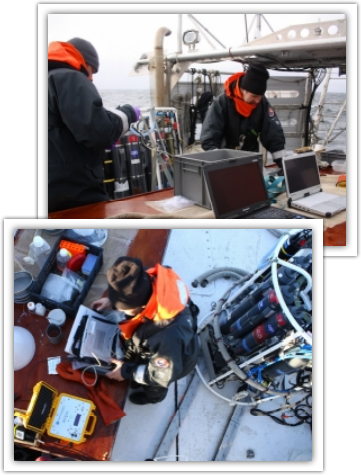 The Toughbook CF-19 was used on deck to collect data from the Rosette sampling system. This instrument comprises bottles and sensors and is lowered into the water to take samples so that the water temperature, salt content, light absorption by water, oxygen content, etc. can be analyzed. All these parameters are sent to the laptop to be analyzed, so that the structure of the column of water can be studied. "The C-OPS radiometer measures the quality and quantity of light that passes through the water and is reflected in the water. The instrument has a very long cable so it can be lowered a long way from the boat to avoid any influence from the shadow of the boat. The collated data was also saved on the CF-19 laptop," explains Céline Dimier, on-board biologist and CNRS researcher. The main objective of the Tara Méditerranée expedition from May to November 2014 was to study and assess the accumulation of plastic debris in the sea, to give a better understanding of the impact it has on the Mediterranean ecosystem. This Tara mission to the Mediterranean meant moving from cold to hot climes. A new piece of hardware was also added to the IT base: the Toughpad FZ-M1, a small versatile fully rugged 7" tablet. This tablet proved to be a great navigation tool, as the Captain needed to look at the charts while navigating outside - he also used it on the deck of Tara and on board the zodiacs - the device's reliability did the rest. 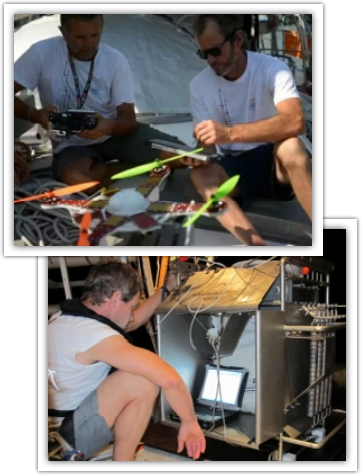 During this expedition, the FZ-G1 tablet was also used for steering a drone responsible for taking images. The crew found it really versatile to use, thanks to its compact size, ruggedness and crisp resolution even in bright sunlight. Its various features are extremely useful when having to contend with the sun's glare on the water and the heat! The highlight of 2015 will be the arrival of Tara in Paris for the months of November and December, where the schooner will act as Ocean Ambassador for the Ocean & Climate Platform. This platform is run with support from the UNESCO Intergovernmental Oceanographic Commission along with dozens of NGOs, scientific organizations, universities and research institutions. It aims to advance the general public's knowledge about the links between the climate and the ocean, before and during the Paris Climate Conference to be held in December 2015 (COP21).